At the risk of sounding like an old episode of 'The Office' or a motivational speaker (as if! ), I'd like to talk to you today about teamwork. And particularly, as you'd probably guess, how teamwork and music are related. I have a theory (not another one, I hear you groan) that nobody who ever leaves a successful music group ever again hits the heights as a solo artist that they did when they were band members. I bet you're wondering if I can back up this potentially spurious theory with some pertinent examples. Well please allow me to try. Has Holly Johnson ever bettered as a solo artist his output with Frankie Goes To Hollywood? What about Midge and Ultravox, Bryan and Roxy Music, Nick and Haircut 100, John and The Beatles, Paul and The Beatles, Paul and Wings, Freddie and Queen, Morrissey and The Smiths, Les and The Rollers, Alison and Yazoo, Diana and The Supremes, Bob and The Boomtown Rats, Mick and Simply Red (just making sure you're still paying attention!). 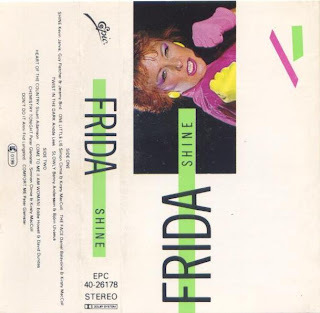 I am of course using this theory to illustrate my choice of cassette of the day, by onetime ABBA co-lead singer, Frida with her 1984 offering, ‘Shine’, wherein Frida attempts to distance herself from her ABBA past by experimenting with a very un-ABBA-like bunch of tunes and sporting day-glo threads as only a person from 1984 knew how. She’s even dropped the ‘Anni-Frid’ at this point, prompting a veritable boatload of ‘there’s no ‘F’ in ABBA’ jokes. Steve Lillywhite sits in the producer’s chair vacated by Phil Collins following Frida’s previous album, although you may hear Phil’s ‘In the air tonight’ drum machine gate-crashing the party every now and again. The quality varies more than somewhat, as is often the case when the tunes are written by a number of different writers, from Big Country’s Stuart Adamson, whose ‘Heart of the Country’ is one of the better songs on offer, to Peter Glenister, Simon Climie and Kirsty MacColl, whose collaborative offering ‘Chemistry Tonight’ is marginally less painful than sticking pins in your eye (sorry Kirsty!). Kirsty and Simon pop up as backing vocalists too. There’s also the interesting concept of a slushy song called ‘Come to me (I am woman)’, written by the eminently qualified Eddie Howell and David Dundas. Predictably though the album’s clear high water mark is the only tune written by two guys called Benny Andersson and Björn Ulvaeus, who seem to be half decent songwriters. If only Frida had bumped into these two earlier in her career things might have turned out very differently.